We inspire students to work independently and creatively. Our students think critically. We teach them the value of caring for other people, their family, the community and the environment. The College of Computer Studies with the guidance of the powerful Almighty shall pursue excellence in developing globally competitive IT professionals who are technically and competently equipped in providing world class IT services. The College of Computer Studies becomes the Center of Excellence and the world-class provider of globally competitive IT professionals in the Philippines and in the international market. The College of Computer Studies prepares the students to be globally competitive with good moral values and ethics, and armed with the tools to perform their duties as IT professionals, and contribute to the Country’s progress and to the world. The BSCS and BSIT graduates are expected to become globally competitive, innovative, and socially and ethically responsible computing professionals engaged in life – long learning endeavours. They are capable of contributing to the country’s national development (CMO 2014). The College of Computer Studies envisions becoming a leading institution in computing education in the country. preserve and promote Filipino and cultural heritage. The CCJE envisions to become the preferred leading center for the study of criminology and criminal justice. The CCJE shall commit to provide relevant and responsive curriculum and innovative technology, sustained linkages with the community and industry and research-based programs geared towards the formation of graduates that meet the national and global demands in the fields of criminology, public safety, public administration, criminal justice and law enforcement. Provide the student with an education in the fundamentals of engineering that will allow him to be immediately competitive in industry or in graduate work while providing him with the best opportunity for achieving his full potential during his lifetime. Develop sense of professional responsibility and social awareness. Provide practical applications as evidenced by laboratory, design project study, computer exercise and practicum courses. These would help the students to work well whether independently or as part of the group. Apply knowledge of mathematics, physical, life and information sciences, and engineering sciences appropriate to the field of practice. Design a system, component, or process to meet desired needs within identified constraints. Work effectively in multi-disciplinary and multi-cultural teams. Recognize, formulate and solve engineering problems. Recognize professional, social and ethical responsibility. Effectively communicate orally and in writing using the English language. Analyze the effects of engineering solutions in comprehensive context. Engage in life-long learning and an understanding of the need to keep current of the developments in the specific field of practice. Apply knowledge on contemporary issues. Use the technique, skills and modern engineering tools necessary for engineering practice. The College of Nursing envisions to become a leading institution in nursing education in the country. The College shall advance the Nursing profession of a relevant and responsive curriculum and innovative technology, sustained linkages with the community and industry and research-based programs geared towards the formation of nurses that meet the national and global demands of health care. The Pharmacy Department becomes premiere training ground for professionally competent, legally qualified pharmacist who will ensure the quality of pharmaceutical services at all times. Vows to maintain the highest principles of moral, ethical and legal conduct; and devote our professional lives to the service of all humankind through the profession of Pharmacy. To provide the highest quality, learner-centered educational programs in selected health sciences to educate a health workforce that meets the demands of the local, national and global health care system. To link educational, research and services activities and programs in a learner-centered environment through partnerships with academic health centers and other health and education related organizations to improve the quality of life of the surrounding communities. To provide top quality education programss so that our graduates get the best carreer opportunities and pass all required board licensing and certification exams. To become the preferred leading institution for Maritime Education in the Panpacific Rim. 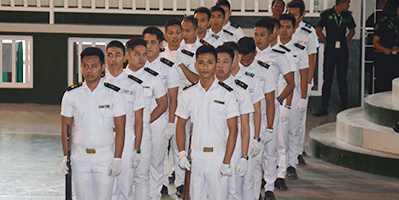 Shall commit to provide quality and excellent Maritime Education Program through the permission of a relevant curriculum and state of the art teaching – learning facilities that meet local and international standards. The College of Teacher Education becomes a College of Choice of students who strive to prepare themselves towards excellence. The College shall advance the teaching profession through exemplary programs in the science and art of teaching and learning such as the effective use of technology, provision of a responsive curriculum and research-based programs and community linkages and collaboration. As the institution moves forward to become a University of choice, the College of Teacher Education shall develop globally competitive teachers who are professionally, technically and competently equipped in providing quality education to the youth. Cherish and nurture a deep love of country through dedicated work and abiding faith in God. The College of Teacher Education is committed to service excellence in teaching, learning, research, innovation, leadership and outreach within the region and beyond. The College ensures that in accomplishing its mission, students are educated to become critical thinkers, effective communicators, information literate, innovative, globally aware, grounded in regional identity, responsible and ethical. To provide the academic framework for continuing intellectual and leadership development that enhances scientific inquiry and scholarly research work in various advanced degree programs and fields of specialization. To produce better quality of graduates who will become citizens of the world. Build on graduate students potentials and ability to synthesize, integrate and put to use knowledge, skills, and capabilities learned. Belen C. Bautista, Ed. D.
Evelyn C. Biay, Ed. D.
Jacinto C. Cabero, Ph. D.
Joy C. Gamboa, Ph. D.
Nova M. Iglesias, Ed. D.
Sherlyn M. Langbayan, Ph. D.
Darcy Rio G. Lopez, Ph. D.
Engelbert C. Pasag, Ph. D.
Renato R. Santillan, Ed. D.